Enter to win a round of golf with the World and LPGA Hall of Famer Patty Sheehan at the exquisite Hidden Valley Country Club. All proceeds benefit the Patty Sheehan Foundation supporting women and children charities in Northern Nevada. Drawing to be held Friday, June 1 at Patty’s Party and Awards. Winner need not be present to win. 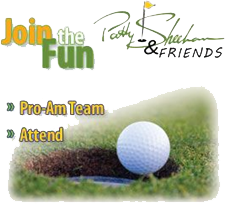 Purchase Raffle Tickets during the Pro-Am Pairing’s Party and during Patty’s Party and Awards.